In 1985 a young girl named Adelaide is taken to the Santa Cruz Beach and Boardwalk by her parents for a day of family fun. When the evening came she was unwatched by both parents just long enough for her to enter a hall of mirrors. There is a power outage and as she tries to get out she bumps into something that leaves her traumatized. Even after her parents take her to therapy she still refuses to talk. It’s now the present day and Adelaide (Lupita Nynong’o) and her husband Gabe (Winston Drake) are taking their two children Zora (Shahadi Wright Joseph) and Jason (Evan Alex) to their vacation home as part of their summer. There is an opportunity to go to Santa Cruz Beach and Boardwalk again, but Adelaide doesn’t want any part of it. Finally after much badgering from Gabe she gives in, but after a terrifying moment for her when she thinks she’s lost Jason (he merely went to the bathroom) she convinces her family to go back to their house. Sometime that night a mysterious family starts stalking them. Gabe tries to reason with them, but to no avail. Then these strangers break into the house and it is revealed that they are doppelgängers of Adelaide and her family. Now the chase is on as each one of the family members tries to escape from his or her own pursuer. When watching this movie I likened it to the essays that I had to write while in high school. As my teachers explained it, you had your first paragraph that was your opener/introduction, then your second paragraph is where you develop the idea that was introduced, and then your final paragraph is your conclusion. With that idea, the first paragraph, or in this case, Adelaide going into the hall of mirrors and becoming traumatized from seeing her doppelgänger was a great way to hook me in. The idea was fascinating, and admittedly, terrifying to meet your own evil twin in this way. When the “second paragraph” begins, Adelaide starts to experience a bizarre series of coincidences. As a child she saw some homeless preacher carrying a sign that simply said Jeremiah 11:11 on it (The movie never explains the passage, but in the KJV of the Bible it reads, “Therefore thus saith the LORD, Behold, I will bring evil upon them, which they shall not be able to escape; and though they shall cry unto me, I will not hearken unto them.”). Upon her return to the beach as an adult with her family she continually runs into instances of 11:11, from other people pushing that passage to significant moments happening at precisely 11:11. All this is to help ramp up the sense of unease until the doppelgängers appear, at which point it took on the tone of some warped slasher movie. I say warped because the evil twins aren’t all there. Only Adelaide’s is capable of speaking, and her voice is disturbingly raspy. None of the others are capable of speech, and only some of them are capable of grunts or something akin to a howl. Because the focus is simply on the family trying to escape their captors we don’t see much in terms of development, but the ride is still pure fun. At this point it plays on all of the classic slasher tropes that scare audience members one minute, and then makes them laugh the next. However, when we get to the conclusion part of the essay this movie completely falls apart. Horror films are all about the unexpected. With a movie such as this it plays on all of the fears that live in the irrational mind. There is nothing rational going on here. Duplicate people? We have no idea what is going on, or even if it actually is happening (more than once I was led to believe this was all in Adelaide’s mind), but when other doppelgängers start showing up the movie is immediately put on a very specific path. Now the beauty of horror is, again, all about that which is irrational, and by making it irrational it no longer has to abide by any logical constraints. 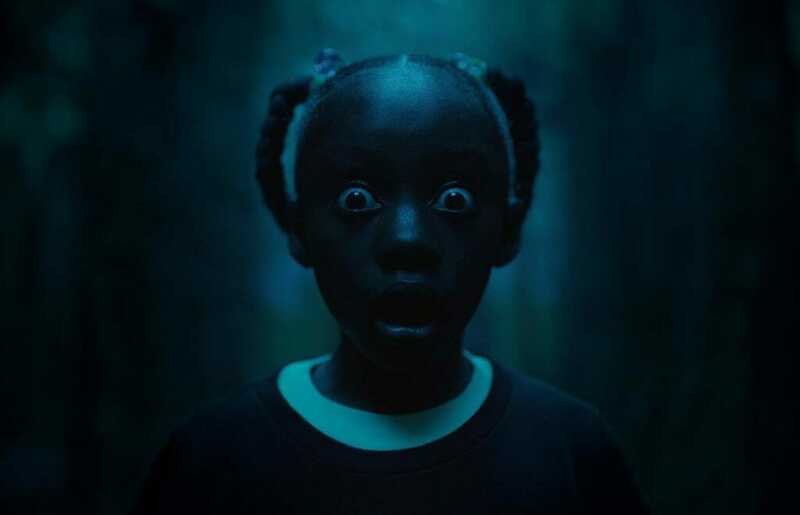 However, in the third act of this movie writer/director/producer Jordan Peele feels the need to provide logical answers, and in doing so provides those very constraints, which he is then forced to violate in order to wrap the movie up. In learning what the doppelgängers are we are provided an idea that is so ridiculously beyond the pale that there is actually no more room for the irrational fear to play in one’s mind. And if that isn’t enough, Peele decides that he wants to try to pull a surprise twist à la M. Night Shyamalan, only it doesn’t fit the constraints that he suddenly applied to the movie itself. As a result all I was left with was a bizarre sense of disappointment. The first two thirds of this movie ranged from horror filled to thrilling, but Peele was not able to make the last third of the movie stick the landing. Instead it stumbled pretty hard. The cast for this movie is incredibly strong, starting off with Black Panther’s Lupita Nyong’o as Adelaide and Winston Duke as Gabe. Duke’s character was stereotypically macho, so there isn’t much depth to his role except to say that it was a delightful departure from the character of M’Baku. 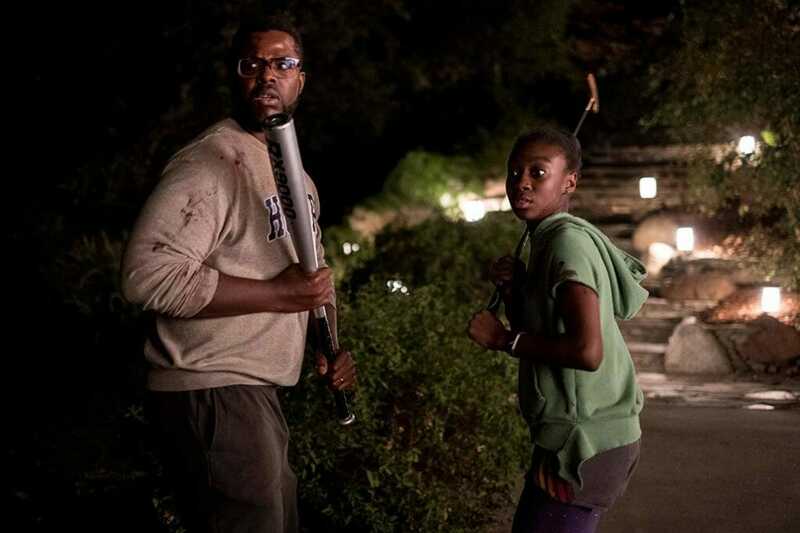 Even the children were incredible as we see Shahadi Wright Joseph as Zora make the transition from running for her life to taking a stand to do what is necessary to save both herself and her family. Evan Alex also showed some amazing range and smarts and range as Jason so that we believe it when he deduces a way to eliminate his evil twin. As for Nyong’o, watching her character completely unravel was mesmerizing, as well as taking in her diabolical and disturbed twin. There is no question as to the difficulty she must have had taking on this acting challenge, but she was completely convincing here, which helped to communicate that sense of horror to this critic. As a director Jordan Peele did a masterful job in crafting this movie. It bounces back and forth between Twilight Zone and Night Gallery, and the slasher action sequences are well presented. However Peele as the writer ended up dropping the ball in telling his story. What started off as a possibly strong psychological horror movie ended up becoming something that aspires at being a B sci-fi flick. I desperately wanted to love all of it. Instead I could only love the first two-thirds, and felt significant disappointment with the final third and ending of Us. Because of its strong opening, fun middle section, but weak ending, Us receives 3 out of 5 scissors.